V-cube's partnership with the largest Web Conference service provider in India, INTELLISYS | V-cube, Inc.
V-cube, Inc. (HQ: Tokyo, Meguro-ku, President & CEO: Naoaki Mashita, hereon as V-cube) will collaborate with the largest web conference service provider in India, INTELLISYS Technologies & Research, Pvt. Ltd. (HQ: Kolkata, India, hereon as INTELLISYS), in the visual communications industry. INTELLISYS will begin offering V-cube’s visual communication services in India as a way to accommodate the needs that are currently not fulfilled by INTELLISYS’ product, “Vennfer”. V-cube and INTELLISYS look to share the expertise and know-how as the No. 1 web conference service providers in Japan and India and achieve a new level of competitive advantage and marketing expansion in visual communication. The visual communication market consisting of video and web conference has arrived at a stage for rapid growth in Asian countries. Accompanying economic growth, the wide spread of use cases for visual communication services in Education, Medicine and many other verticals is expected to be just around the corner. In India, the government is strongly pushing for the ICT of social infrastructure guidelined by Digital India. This means that one of the fastest growing countries in Asia is also expecting fast growth in the visual communications market. INTELLISYS offers its proprietary technology and service, “Vennfer”, that enables seamless video and audio communication over narrow bandwidth INTELLISYS’ offering is widely implemented in the government sector in India, generating US$40M of revenue. It is truly a leader in the visual communication industry. V-cube, looking to become the No.1 Visual Communication Platform in Asia, has subsidiary companies in China, Malaysia, Singapore, and Indonesia all of which have many government and enterprise success stories. V-cube’s overseas business accounts for roughly 20% of its total revenue. Thus in order to further accelerate overseas business growth, V-cube and INTELLISYS will share success experience and know-how to establish growth mechanism in the Asia region focused on India. V-cube’s visual communication services ”V-CUBE” flexibly fulfill customers’ needs and enabled not only web conference between remote locations, but also training/seminar, remote sales and support. Additionally, V-cube also offers dedicated solution for remote education, telemedicine as well as low-cost video conference. Combining “Vennfer” and “V-CUBE” to better meet customers’ requirement allows rapid growth in the visual communication market in India. INTELLISYS can now offer V-cube’s videoconference solution, “V-CUBE Box” and thus enter the videoconference market in India. INTELLISYS’ offering, “Vennfer”, is developed by capable engineers in America and India. Its strength is the ability to allow smooth and scalable communication of audio and video across multiple locations through multicast even when the bandwidth is as narrow as 128kbps. In many places in Asia where network environment is poor, V-cube is now able to offer customer the solution to guarantee smooth communication across different locations and thus increase the penetration of visual communication services. 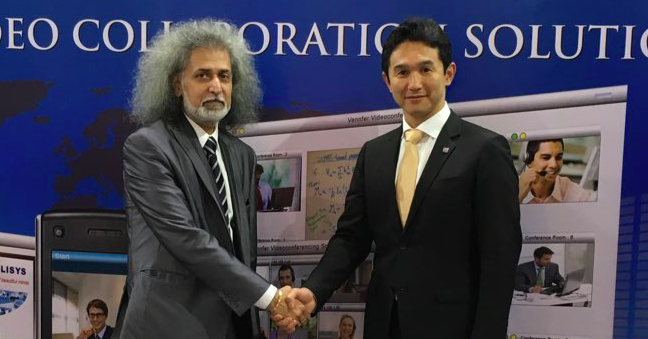 V-cube and INTELLISYS will work together to meet the needs for visual communication in India and continue service offering and technological exchange. V-cube’s group companies for learning management system - Wizlearn Technologies Pte. Ltd. and System Technology-i Co.,Ltd. - are also expected to join the alliance in the near future. Company Name: INTELLISYS Technologies & Research Pvt. Ltd.